I would like you to meet Baby J. and his mum. Baby J. was christened last weekend. The parents chose a silk embroidered romper with a matching hat and booties. Thank you so much for allowing me to share your son's special day with my clients on my blog.I am a true believer that a picture tells a thousand words, don't you all agree ? Embroidered raw silk boy's romper with handmade matching silk piping across the chest,cuffs and hat . This quality baby boy's dedication romper has two invisible ( hidden) zips for easy excess. This unique designed embroidered silk romper has white plastic shank matching silk covered buttons on cuffs and one has been hand stitched on the top of the baptismal hat. Dana - Your work is absolutely gorgeous! You are doing what I dreamed of doing several years ago. I love beautiful christening gowns and thought at one time that I would have a business making them. For a few years I made wedding gowns instead and did clothing alterations but my heart was really in gowns and rompers for the little ones. So I admire the work you do. Thank you for visiting my blog and for leaving your sweet comments. I will come back here again to see what you have to share. 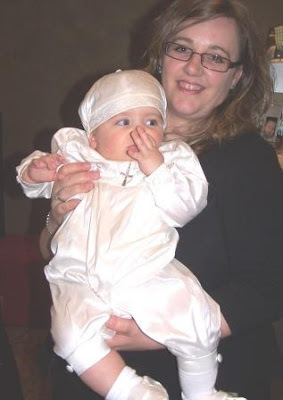 This is a photo of my son on his Christening Day (18.5.08). He looked so sweet. I would like to thank Dana for making such as lovely outfit for him. She is very creative, talented and passionate about what she does. I just love love love her work. She has a real gift. I wish he could have his christening again just so he can wear his outfit again!